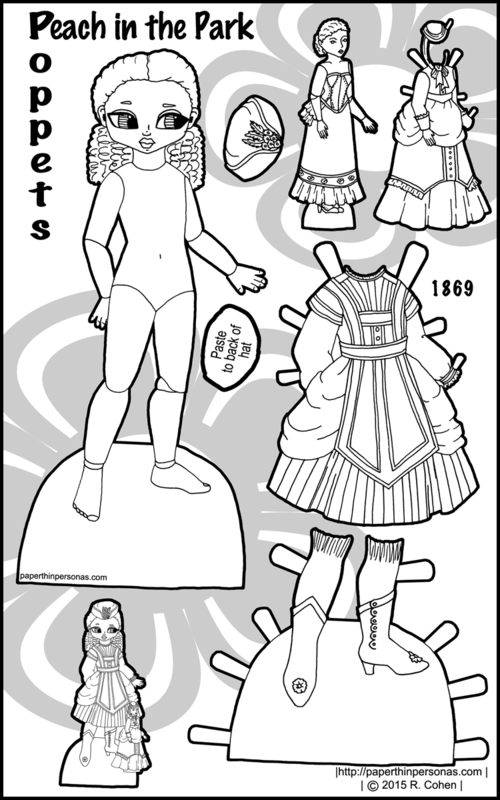 Today’s Poppet paper doll is all about Victorian children’s clothing of the late 1860s and early 1870s. I love Victorian children’s clothing. I just love it. I even love it in the 1840s when I generally think all the clothing looks really stupid. I think it is a combination of my natural fascination with childhood studies and exposure to books like The Little Princess at a young and impressionable age. It is likely also because I have a fondness for the idea of antique dolls with little wardrobes of perfectly sewn clothing pieces. The Little Princess was full of dolls. Anyone else remember that book? And I am not talking about the Shirley Temple movie version where her father wasn’t really dead. I’ve never forgiven them for changing that part. Anyway, we have Peach, a new Poppet paper doll, with an elegant promenade costume from Godey’s Lady’s Magazine in 1969. Her fashion doll also has a Promenade costume from that same fashion plate. I couldn’t find a decent reproduction of the plate online. Because Godey’s plates folded out, when people digitize the bound volumes they rarely take the time to fold out the plates. The result is that the text is reproduced, but not the folded plate. This is one of my pet peeves about mass digitization projects. Back to the paper doll- Peach has, of course, a French fashion doll with her who I have left unnamed. Her fashion doll has a walking dress of her own with a hat attached. I have rarely drawn something as small as the fashion doll and I am worried a little about the fit of the gown. I did a quick Photoshop fit test, but you might want to leave some black border for wiggle room on that one. 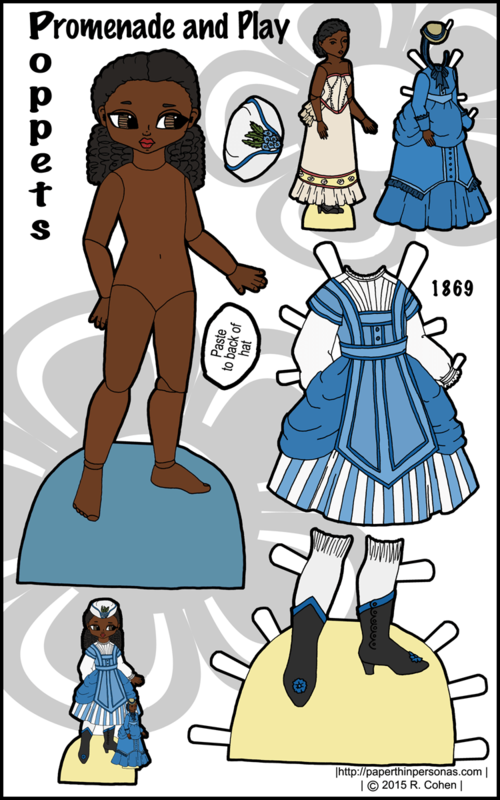 I love the whole paper dolls with their own dolls which are also paper dolls thing. It is hard to pull off though. Anyway, I used several sources when working on today’s paper doll. The doll herself is based on the brown-complexioned bisque bebe dolls produced in France and Germany by companies like Steiner, Bru, Jumeau and many others. You can see some examples of these dolls on my Pinterest Board about Antique dolls. These dolls were most common in the late 19th century. As I mentioned above, her dress is from an 1869 Godey’s Lady’s Journal fashion plate. I used Dover’s excellent book- 80 Godey’s Full-Color Fashion Plates, 1838-1880 (ISBN: 978-0486402222), now out of print, for the 1869 plate. I know there are lots of sources online today for fashion plates, but too many of them omit the context of the plates, since plates were often cut. That is why I like having books of fashion plates in my collection for reference. Next week, I will share a related Poppet clothing set with some underwear from the 1870s- when even children wore staybands or corsets- and two more outfits and a ballgown for her doll. Also, another pair of shoes with stockings. I really do have to draw more historical children’s clothing for the Poppets. I had far to much fun with this set. Remember that you’ll need to cut along the shoulders of the paper doll, so that she can wear her dress. Peach is very pretty and has a lovely dress. I like the combinations of stripes on it and the sky-like colors. I too enjoyed “A Little Princess” as I child, even drew a set of paper dolls depicting Sara and Becky.